We really had barely anything fresh left that morning - not even good-melting cheese (a major shocker for this cheese nut) - but we did have eggs. A frittata is often the perfect solution for this kind of morning. Again, the basics sufficed - we had one red bell pepper, a red onion, a couple of basil leaves, and the end of a parmigiano-reggiano slab. I cooked onion and pepper in a large pan, poured 7 beaten, seasoned eggs that had been combined with julienned basil over top of them, covered with a 1/2 cup or so of freshly grated parm, and let it set in the pan over medium heat. This is as basic a frittata recipe as you can get, adapted from Mark Bittman - for this amount, I might've gone with a smaller pan for a thicker frittata instead, but this worked well, too. 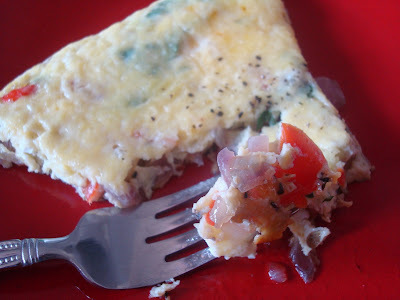 I love frittatas because you can vary the basic recipe based on what you have on hand. Go Greek with tomatoes, fresh oregano, and feta. Or go just plain Yum with spinach and goat cheese. Really, anything will do. Delicious, with plenty for lunch the next day, too. I love a good frittata made from leftovers. Have you ever had one with pasta as the base? If not, here's a recipe to try: http://theculinarycouple.com/2007/11/15/carbonara-pizza/. The noodles get all crispy, and there's a ton of cheese! Enjoy! Yum!!! Will you come cook for me and help me figure out what to do with the random ingredients I have in my kitchen. Last time we made stuffed peppers we used ground turkey and it never cooked and ruined the whole meal and thereafter my appetite. Your way looks much better. No browning under the broiler? Monsieur Maillard is your best ami. I'm a total frittata freak! We sometimes make our sans cheese all together, though cheese does kick it up a notch. Looks tasty! If you really want to use every last scrap, save the hard rinds on parmesano/romano slabs and freeze them. Next time you make soup, throw in the rinds to spike the flavor (I like it in vegetable). Fish out what's left before serving. So good! One of my fave tricks, Nancy - I once uploaded an entire series of parm rinds in soup to the Le Creuset pool on Flickr. DORK. But you're right - the flavor it adds is incredible! Isn't it fun when you pull together a yummy breakfast when at first it looks like you are going to have to go out or perish? I love a challenge. 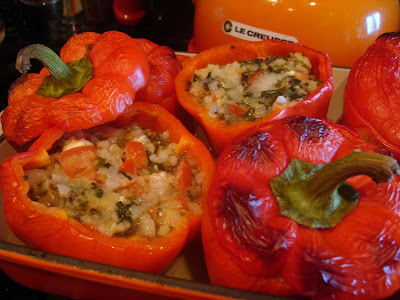 Bit of random- my older sister Loves stuffed peppers and I hated them so I haven't had them since we were kids and she moved out for college... maybe I need to retry them as those look fantastic.